I am always skeptical in trying new products - especially whitening products. But when my friend told me that the Crystal White Gluta Whitening Tablet may be the product that I didn't know I need, I still said okay. He was talking to me like an angel- glowing skin and looking perfectly blooming. I am happy with my skin color but I always worry about uneven skin tone (especially after basking under the sun and traveling). Before taking any supplement or whitening capsules/tablets, I always check the label and ingredients. The Crystal White Gluta Whitening Tablet is made with L-Cysteine which is a natural glutahione in the body and inhibits the function and activity of Tyrosinases which helps in the reduction of Melanin. It also contains Glutathione, which we all know that detoxify harmful compound in the body. Grapeseed: has an anti-oxidant properties like neutralizing free radicals, reduce inflammation, stabilizing collage and elastin, and protecting and healing connective tissue. It is 50% more potent than Vitamin C.
Vitamin C: improves body repair and recovery from injury. Resveratrol: protective compound produced by grapes and other plants. It has the ability to inhibit platelet aggregation which prevent free radical damage in the body and provides cardiovascular system protection. Polygonatum Odoratum: it strengthens the activity at taking away free radicals and reducing contents of MDA. How to take Crystal White Gluta Whitening Tablet? It is recommended that you take 3 tablets daily for better results. The result is usually seen after 2 weeks. Crystal White Gluta Whitening Tablet has numerous benefits for the body. 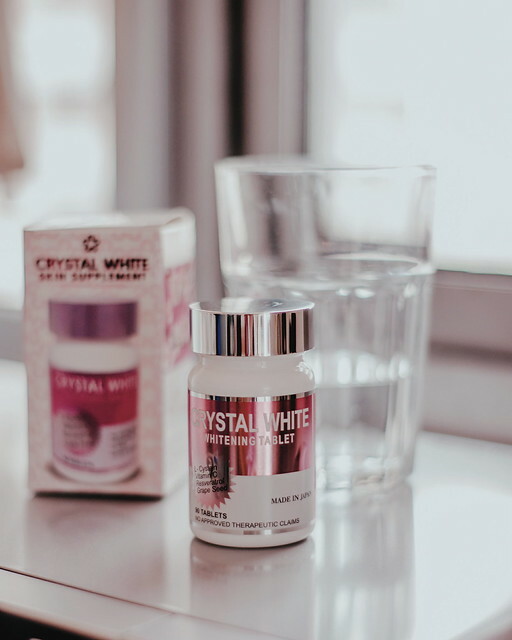 Although I feel that most of them are functions that my body current enjoys (like regular bowel movement and better sleep), I am still hopeful that Crystal White will help me achieve my best form. 2. Helps give better sleep. 3. Helps in forming a toned body through burning fat. 4. Protects cells from damage due to sun exposure. 5. Prevents the release of dark pigments in the skin. 6. Contains 7 ingredients that help skin achieve its full potential. 7. It is in tablet form which helps prevent risk of residue. I am only in a few days of taking the Crystal White Gluta Whitening Tablet and maybe it is a little too soon to see the results. I notice though that my skin is less oily and less prone to break out (especially that I am in my cycle and is the time of the month). I always get bruises (because I am careless like that) yet, I notice that I heal easily. I didn't experience any side effects or upset stomach after taking the tablet. But I make sure that when I test/review the product, I didn't have any planned trips. 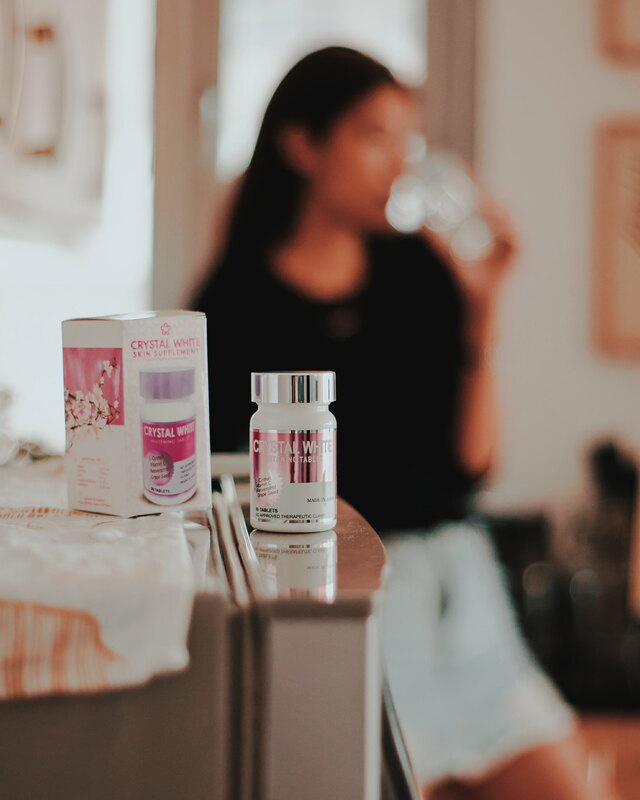 The Crystal White Gluta Whitening Tablet effects may be a result of different factors like my lifestyle and diet. I love drinking water and I make sure that I get my 8 hours of sleep every night. I am also very religious in following my skin care routine and visiting my skin care clinic. 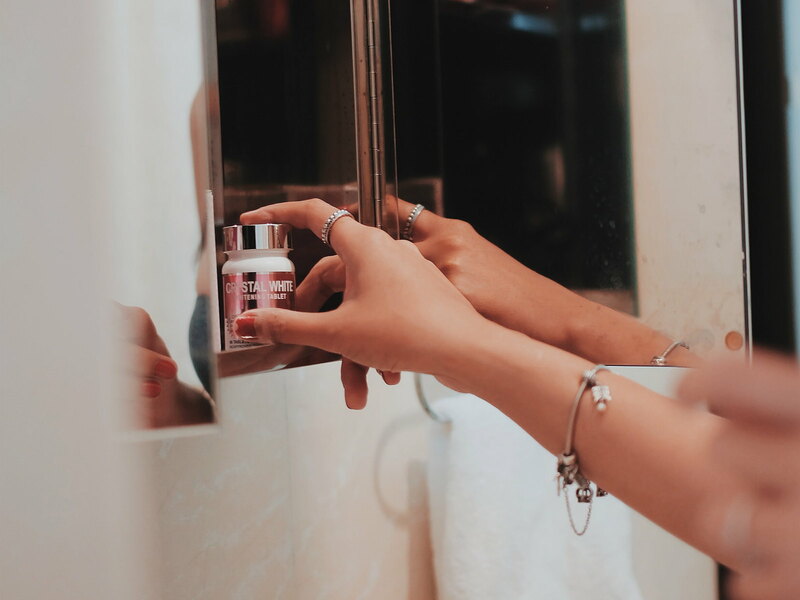 Have you guys tried Crystal White Gluta Whitening Tablet ? What whitening products do you use/take? Crystal White is priced at Php 1,950.00. Available at BeautyMNL and Shopee.